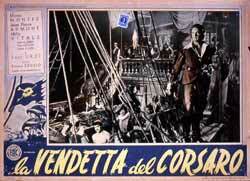 Count of Roccabruna turns into a feared pirate to seek revenge for his father's death and to free his step-sister from the spanish jails. Our hero's life is a long chain of dangerous missions and breath-taking adventures: duels, kidnappings, attacks to fortified castles and risky escapes... But only with the help of a beautiful lady with whom the Count falls madly in love his stepsister is saved from the horrible spanish dungeons and restored to her rightful throne!